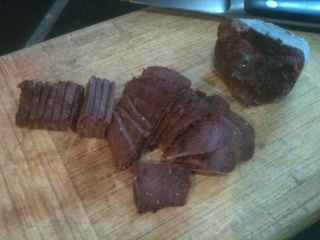 Here’s how two frozen cubes of liver look on my cutting board; one is thinly sliced and ready for use in any recipe. It’s not just what’s in holiday stockings that mamas keep a secret. Some secrets are better than holiday gifts and can, if helpful, remain a secret. Shhh…. This post is about….organ meats! Ha, HA! Perhaps there is a child in you, too, who is wiggling? Here is the painless truth: organ meats are so good for you that they are not to be avoided. Whether you are feeding a family or just feeding yourself this is the post that will help you incorporate organ meats easily into your diet! My mother is Jewish, a rich heritage that includes fried chicken livers. She is also such an enthusiastic gourmet that taking my sister Jill and me to the loveliest French restaurant regularly for pate and other delicacies was a shaping influence in my childhood. And my father’s love for foie gras, always on a hot plate, to keep the fat from congealing, is also a happy memory. These influences that many would gag at, are for me memories of nostalgia and yes, nutrition. Compared with muscle meats, organ meats are richer in just about every nutrient, including minerals like phosphorus, iron, copper, magnesium and iodine, and in B vitamins including B1, B2, B6, folic acid and especially vitamin B12. Organ meats provide high levels of the all-important fat-soluble vitamins A, D, E and K, especially if the animals live outside in the sunlight and eat green grass. Organ meats are also rich in beneficial fatty acids such as arachidonic acid, EPA and DHA. Organ meats even contain vitamin C—liver is richer in vitamin C than apples or carrots! Even if you add only small amounts of organ meats to your ground meat dishes, you are providing your family with super nutrition. . . Some of you may feel that you have a vitamin and mineral supplement that is very good, that supplements whatever you may be lacking in your diet. This could be an excellent excuse to avoid foods like organ meats, foods that require creative preparations or challenge you to branch out into a world of more work and less initial appeal. But vitamins and minerals in supplement form are an expensive, modern invention that are not always helpful. (Trustworthy doctors can do blood tests and let us know if we’re really lacking in some area; supplements in these situations and sourced from well-reputed companies are truly worthy and definitely necessary at times!) However, most vitamins are synthetic and are not in a biochemical form to be recognized and absorbed. They are made cheaply and tax our bodies to quickly excrete them as waste. The absorption rate is 9% for most synthetic vitamins. The good news is that there are super-foods, foods found in nature, that pack a real punch when it comes to providing a concentrated source of vitamins and minerals. Organ meats top the list. So palatability remains the only issue! Let’s discuss some of the organ meat options and what it’s like to eat them. From my own experience I can vouch for heart. Brains and lungs I have not yet had. Liver is great, depending on the preparation, which I’ll discuss more below. Kidneys? Yes. And yum. I always gobble up the kidneys straight from a cooled roasted whole chicken; it is a treat for me that I know is nutritious. (Find them inside the cavity; they are not gamey, just delicious!) The thymus gland and pancreas, referred to as sweetbreads, I have not yet had but have found a tempting recipe for sautéing them with bacon. Tongue is quite good; but frankly, I did not enjoy preparing it. And perhaps the most notorious of all organ meats? Rocky Mountain Oysters! Yes, I can proudly say that testicles are the yummiest organ meat around. My husband and I daringly ate deer testicles before we knew how good they were for us. They were an absolute delicacy. We savored each small bite, two bites total for each of us. All of these organ meats are excellent nutritionally, with varying detailed nutritional assets depending on the organ. My kids are, of course, dubious about our family’s first and future exposure to brains. But I do not intend to feed myself anything icky either! The next time my husband or brother-in-law gets a deer or elk, I’m all for using the whole animal! I love that historically the Native American Indians, as well as the French even to date, and many other cultures, know the value of not wasting and ah-ha!, the blessing that comes to those who will delve a little deeper into sustainability; the thrifty consumer of all organ meats is actually healthier for their open-mindedness! Below I have included some recipes and strategies, all with liver in them. What a wonderful blog lays ahead one day in the future when I hope to also share a trusty lung or brain recipe! Ha, HA! But in the meantime, I will share the not-new secret of how to feed organ meat to your family successfully. One way is to hide the pureed organ meat in a dish with ground meat. So last night we had a LOVELY winter squash stew with lamb, pork, tomatoes, Italian spices, lots of kabocha squash, and venison liver. My four-year old cried today when he found out that I had eaten the last of the leftovers. Success. I pureed all the organ meat and then filled ice-cube trays with the puree. When it was frozen I ran some warm water over the bottom of the ice-cube tray so the cubes popped out easily. I put all these cubes into fresh zip-lock style bags and returned them to the freezer. Two or more nights a week I put two cubes of organ meat into what I’m cooking. The result is always rich. No family member had yet mentioned a gaminess or asked any suspicious questions about organ meat until I dared add three cubes! So from personal experience I recommend using only two! It is better to start with less organ meat in each recipe but serve such recipes more often in the week than to do what so many did in the past which is to serve a whole plate full of liver occasionally, which will perpetuate a terrible reputation for organ meat, elicit sure dissatisfaction from 99% of all eaters, and not benefit anyone’s health regularly. The reason for this is not just the flavor of plain liver, but its texture. When I have successfully sautéed chicken livers, they are first sliced, then dredged in beaten egg and either flour, or the grain-free equivalent, which has been mixed with sea salt and pepper. I then fry them in bacon fat or half bacon fat, half butter/coconut oil. The crispy outer coating and wonderful flavor compliment the inside richness, which having been sliced thinly, never reveals a displeasing texture. If you have access to a hunter who stubbornly refuses to ever enjoy these nutritional powerhouses, or just isn’t “there” yet, he or she will most likely be thrilled to have a home for these sometimes-large organs. Most hunters understand the magnitude of life and the value of the best quality grass-fed meat. They may not want to learn to like organ meat themselves but they will be pleased and curious that the meat has found such an eager home. So best option? Ask your favorite hunter to rinse, wrap, and share the organ meats from their next hunt or perhaps from their freezer. The next best option is to buy sustainably sourced organs from a local farmer. If you know of a local farmer that raises their meat without soy or corn supplementation, allowing the animals to graze on grass all the way up to the point of slaughter, that is also an excellent choice. Sustainable Table says, “Truly sustainable livestock farming requires the use of a pasture-based system. Pasture-raised animals roam freely in their natural environment where they’re able to eat nutritious grasses and other plants that their bodies are adapted to digest. In addition to dramatically improving the welfare of farm animals, pasturing also helps reduce environmental damage, and yields meat, eggs, and dairy products that are tastier and more nutritious than foods produced on factory farms.” They continue, “It is estimated that 12 to 32 % of all feedlot cattle develop liver abscesses as a result of the high-grain diet.” Well, it is obvious these are not the livers we want to be eating! Yulch. If you are not already in touch with a local farmer or a local meat market that provides grass-fed meat, here is a resource for finding both local and online sources for trustworthy organs: www.eatwild.com An additional online source for sustainably raised organ meat is www.grassfedtraditions.com They also have lovely soy-free, pastured eggs and more. My last favorite site well worth visiting and ordering from is US Wellness Meats found at www.grasslandbeef.com They carry tripe!, (beef stomach), another coveted organ by organ-lovers, as well as sweetbreads, and other more common organ meats. Beyond the expected, one final treatment for liver deserves special attention. A wonderful article is written by Lynn Razaitis for the Weston A. Price Foundation titled The Liver Files. 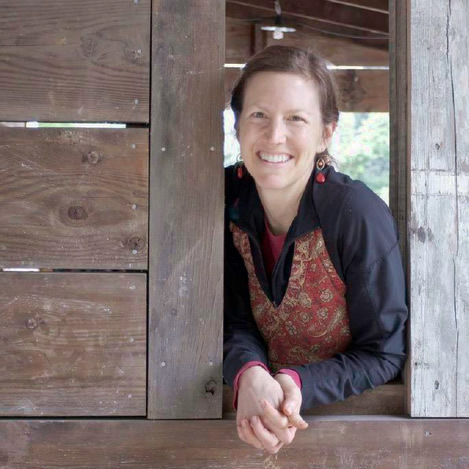 She mentions that in addition to cooked liver needing greater emphasis in our diets, raw liver has always been highly esteemed, sometimes even revered, by former cultures. Its nutrition is perhaps greater in this state. One precautionary measure is encouraged: to freeze the liver for a minimum of 3 weeks first, to kill any potential pathogens, if you are going to eat it raw. Many modern advocates for this dietary inclusion simply cut the raw liver into pill shaped pieces and then freeze them in this state, swallowing them whole and frozen. They are easy to digest even without having been pureed. But I don’t always want to take the most convenient route. As long as I love whole foods, I want to learn to love whole foods, not to just close my eyes and swallow something so I don’t have to taste it. The pills are a nice option when life won’t slow down; but when you can make the time, what follows is even nicer. While almost ready to publish this latest blog on organ meat consumption I ran into a customer and friend who recently had been so fortunate as to attend a cooking class which focused on how to prepare organ meats, hosted by two women from the local chapter of the Weston A. Price foundation. She was so impressed with the deliciousness of their recipes. And I was delighted at the synchronic timing of our meeting. I was delighted that I might be able to improve this article for you, and to add more insights as a result of talking with her. The most compelling and innovative preparation she mentioned was indeed with raw liver, a smoothie/milkshake! This sounded so exciting to me, and something I had never heard of or tried. So the very next day we made our own versions at home. We cannot have dairy products because of our healing diet and health issues; but one day I hope to enjoy our adaptation of her original recipe. I have included below both that dairy adaptation as well as two more that we developed dairy-free. They are fabulous! And you truly cannot taste the liver in any of them. I call the first two recipes “horchatas,” because they are reminiscent of the sweet delicious cinnamon rice or almond milks that are common in Latin cultures (but first originated in Egypt). While most horchatas are dairy-free, this drink has evolved from one culture to the next so much over time, I feel it safe to poetically label this beautiful drink, “horchata,” too. 1) Pull frozen liver cubes out of freezer 10 minutes before you’ll need them. 2) After 10 minutes have elapsed, with a sharp knife shave the sides of the cubes to create “peelings” of the liver. (This will help it to process more smoothly in the blender.) The final end pieces can simply be chopped into dice-size pieces when slicing becomes too difficult. 3) Place all ingredients into blender in the order they are listed, including the liver. 4) Process till smooth, about 50 seconds. Serve. 2) While waiting, add the water and hemp seeds to a high-powered blender. 3) Blend on speed 5, or a medium speed, for 50 seconds. 4) After 10 minutes have elapsed, with a sharp knife shave the sides of the cubes to create “peelings” of the liver. (This will help it to process more smoothly in the blender.) The final end pieces can simply be chopped into dice-size pieces when slicing becomes too difficult. 5) Place all remaining ingredients into blender in the order they are listed, including the liver. 6) Process till smooth, about 50 seconds. Serve. Blueberries are one of the only fruits (in addition to citrus fruits like lemons and limes) that do not produce a ph in the stomach different from the one required to digest meat. Most fruits should be eaten as a snack, not with meat dishes. And the dark color of blueberries, as well as their flavor, go beautifully with the liver; although the liver’s flavor is indistinguishable. After making and enjoying these smoothies my mind soon rested on porridge, another food with a natural affinity to absorbing sliced frozen liver puree*. Happily, the results are delicious! Use your favorite soaked oatmeal recipe if you eat grains or your favorite chia seed porridge recipe if you are grain-free. Add the sliced, raw liver to the hot porridge just before serving, stirring it well in a hot pot to ensure that the liver is well-distributed and fully melted; or blend the raw liver into homemade nut milk, as I do below. Adding berries, milk or dairy-free milk, and nuts or other garnishes, to the finished porridge will be helpful in throwing off the scent, so to speak. A chunky, slightly sweet porridge has a lot going on. My kids did not know there was liver in their chia seed porridge the first time I made it. I just received lots of, “yumms” and the like. Here’s my recipe for chia seed porridge, with liver. 4) After 10 minutes have elapsed, with a sharp knife shave the sides of the liver cubes to create “peelings.” (This will help it to process more smoothly in the blender.) The final end pieces can simply be chopped into dice-size pieces when slicing becomes too difficult. 5) Add this liver to blender and process again on speed 5 for 50 more seconds. 6) Place milk into a medium size saucepan and gently heat it to desired temperature, stirring occasionally; do not let it simmer. 8) Serve the porridge and garnish with fresh berries, optional milk, sweetener, and homemade chocolate syrup. 9) Variations include diced, peeled granny smith apple, cinnamon, honey, and sprouted nuts. *For porridge you may want to cut some layered slices into long thin strips just to ensure that they dissolve texturally. For smoothies, the initial slivers are more than adequate. Cheers and let me know how your organ adventures turn out! It is not recommended to eat the brains of wild deer or elk. There is a brain disease that has presented itself very rarely in five US states that can make humans sick if consumed. However, grass-fed domesticated animal brains are indeed healthful and considered a delicacy for many cultures, eaten by some on the day of slaughter. The nutritionists I respect, which advocate for the Weston A. Price and Nourishing Traditions’ ways of eating, do HIGHLY recommend supplementing our diets with a fermented cod liver oil/butter. This can come in pill form, because there is NO way to make this stuff delicious, and provides vital vitamin D in the right proportion with vitamin A for our general wellness. And it is a whole food, not a synthetic supplement. Can I have the recipe for preparing the liver for the ice cube trays? I can’t locate it in your articles. Thanks. I pureed all the organ meat and then filled ice-cube trays with the puree. When it was frozen I ran some warm water over the bottom of the ice-cube tray so the cubes popped out easily. I put all these cubes into fresh zip-lock style bags and returned them to the freezer. Two or more nights a week I put two cubes of organ meat into what I’m cooking. Any advice on how to work with liver that is already frozen? I have good sources for liver, but I can never eat it in such large amounts once thawed, and grating it still frozen by hand is difficult and the yield is small. Can it be refrozen once it is thawed? I love the idea of having the frozen cubes on hand! Hi, yes, it can be re-frozen once it is thawed, no problem, no freezer burn; perfect!